The Champion Window provides a lifetime of reliable, trouble-free operation, as well as a very high level of energy efficiency for your home. With Champion Windows, you will find quality windows and doors that help builders achieve better results with quick delivery times, personalized service and minimal call backs. Champion Window offers multiple glass packages which meet all window requirements without using a different window series. All of our glass is produced locally within the Continental U.S. by two of the leading at glass manufacturers in the U.S.
Clear glass is the basic of all glass types. It comes without any sun protecting coat unlike other glass types we have to offer. Low – E standard (Good) – This type of glass is prepared with a very thin transparent coat in order to reflect the UV Rays but let’s visible light in. 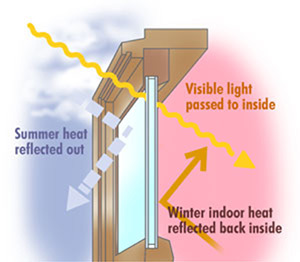 By choosing a Low – E Glass package, the house will automatically feel more comfortable and stays cooler. In the winter, the process is reversed. It keeps the heat inside the house. A good U-value performance. Low – E upgraded (Better) – This type of glass is prepared with a thicker transparent coat in order to reflect the UV Rays but let’s visible light in. By choosing the upgraded Low – E Glass package, the house will automatically feel more comfortable and stays cooler. In the winter, the process is reversed. It keeps the heat inside the house. A better U-value performance. Low – E with Argon Gas: (Best) – This type of Low – E glass is the highest performance glass in the Low – E class and can be added to any of our glass packages. The Argon Gas helps to keep even more of the southern California heat out of the house and keep your house cool and your utility bills low. Our best U-value performance. Tempered Glass, also called toughened glass or safety glass is a special type of glass often used to prevent injuries since it scatters upon impact. There are several universal building codes that require tempered glass in certain impact zones.